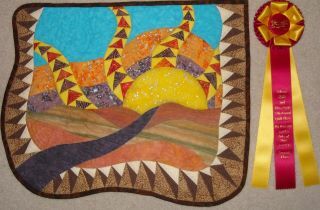 This image just arrived, from Sharon Dickerson, who won a 2nd place ribbon in the Art Quilt Category at the Folsom, CA Quilt Show, 2012. Congratulations! What a great time I had in San Diego! The El Camino Quilter’s Guild is a very fun bunch of ladies. Show and Tell at their guild meeting was incredible! 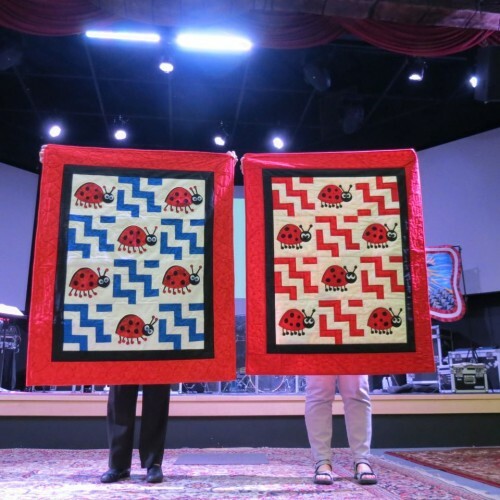 These are matching Lady Bug quilts by Joy Ameel and Eloise Housman for two as yet unborn twins! 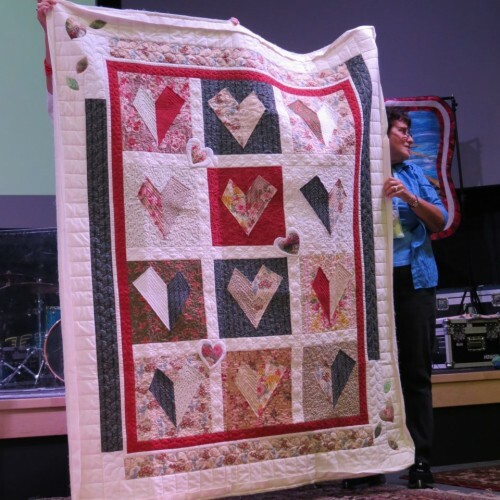 This quilt by Laura Venegas was stitched with love in memory of her dear departed husband. An excellent tribute to a long-lasting love! Happy Valentine’s Day to everyone!! I had a grand time in Des Moines last week! 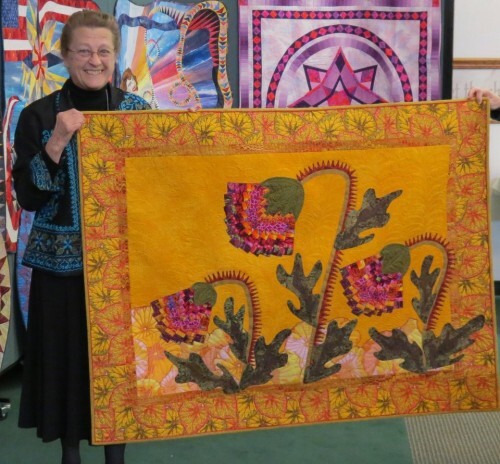 Two lectures for the Des Moines Area Quilt Guild followed by two days of classes! There was hardly any snow on the ground and the restaurants were fabulous! Show and tell was inspiring. 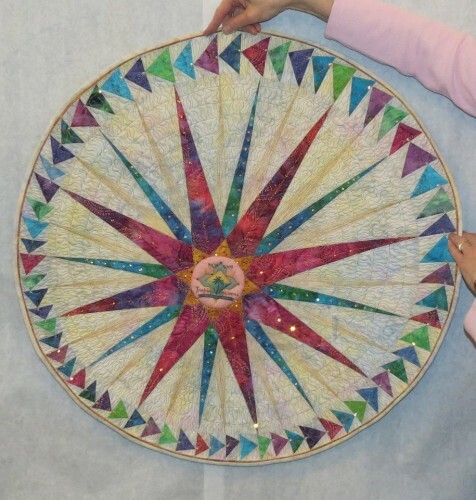 Jennifer Bernard, Iowa, created this quilt after taking my class several years ago. Janeen Pearson and Tamara Watts-McPhail created this quilt. The center was done from my Cartwheel Constellation pattern that appeared in the American Quilter magazine about a year ago. They created their own borders! Wonderful! While at the Des Moines class, JoAnn Belling received her new issue of American Quilter Magazine — which included the article she wrote. 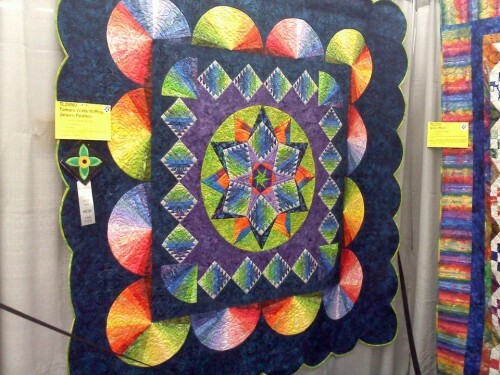 And, here’s JoAnn’s quilt that was featured in the magazine! The 2012 Hawks Aloft Raffle Quilt! We did it again: stitched the quilt top in one weekend at the cabin. Presenting the 2012 Hawks Aloft Raffle Quilt! Thanks to all who participated! Thanks to Steve Elkins for taking the photograph! 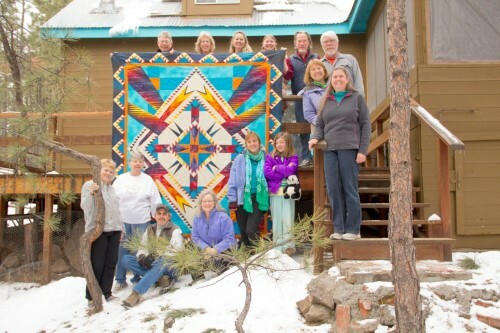 Shown in the photo are: myself, Anita Marsh McSorley, Sami Sanborn, Steve Elkins, Michele Hymel, Mike Hymel, Ruth Burstrom, Debbie Prescott Caffrey, Chellye Porter, Lizzie Roberts, Rhianna Roberts, Amelia Porter, Mary Chappelle and Ed Chappelle at Jemez Mountains, NM. More photos from our weekend quilt retreat are posted on my Facebook page. I have raffle tickets, they are $1 each or 6 for $5. We will be selling them at various birding and quilting events or you can contact me about buying tickets. Some of you may remember the days, oh so long ago, when I used to publish garment patterns. 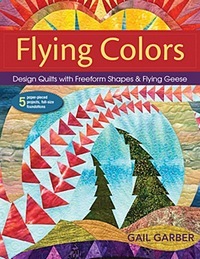 That ended back in the mid-1990s when I decided to focus on writing books and designing art quilts. For all pattern-makers, sample garments are essential. Over the years, the garments added up, resulting in an overly bulging closet, full of garments I no longer needed. So, I donated them to my friends at Thimbleweeds Quilters in Rio Rancho, my hometown. 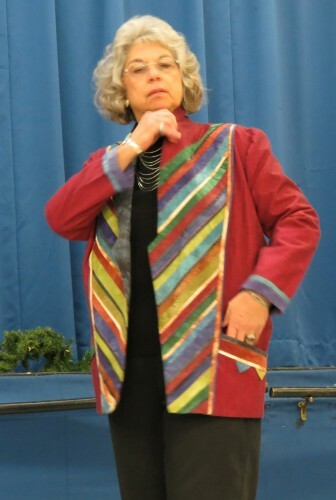 My friend, Donna Barnitz, organized a fashion show for their January 2012 meeting and I stopped by to help with the commentary! 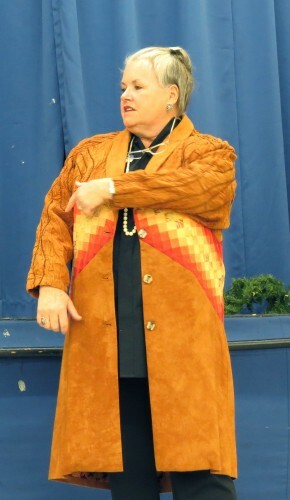 Here are images of just a few of the garments, Red’s Duster Coat, Dreamweaver Jacket, Circle Skirt, and Scrap Wrap. Following the fashion show, they initiated a silent auction in which members could bid on individual garments. The goal is to raise funds for the local 4-H group, for their sewing extravaganza. The funds will be used to purchase Gingher scissors for each ‘winner’ that participates in the spring show! A very worthy cause! I love the week between Christmas and New Year’s! It’s about the only time of year when I have the luxury of doing exactly what I want to do. And this is what I wanted to do — today! 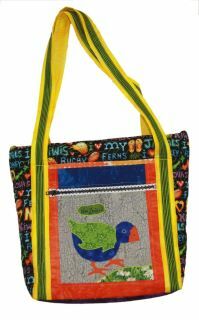 The quilt block in the tote bag was made by Charis Webb who gave it to me in 1999. Nothing like procrastination. I prefer to think I was waiting for the perfect project! Thank you Charis! The tote was the gift bag for my Christmas present for my friend, Sami Sanborn, who went on our trip to New Zealand in November 2011. Well, I’m finally home after three wonderful weeks in New Zealand. It was a great trip, but it’s always nice to be back home. And I’m looking forward to being home over the holidays and maybe doing a little sewing. My teaching schedule was fairly hectic right before my trip, so I was really pleased to get two e-mails this week from students who took my classes and finished projects that they started. 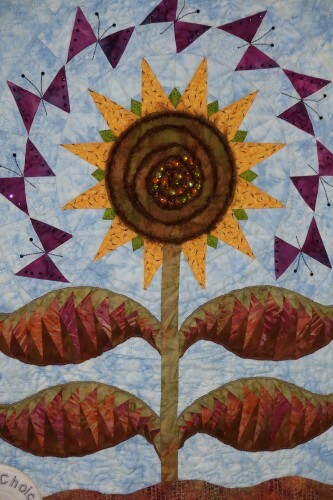 Here is a photo of the beautiful quilt that Donna James made. 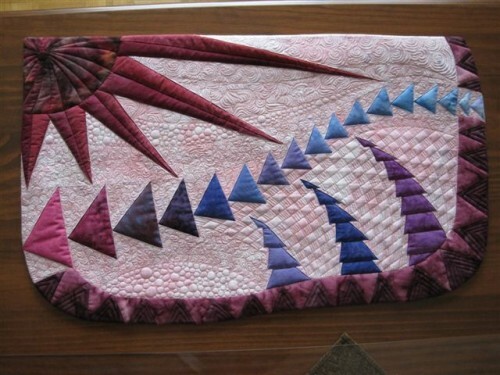 And here is a photo of the right corner, showing her lovely quilting. I completed this design in your The Goose is Loose class at MQX West in Portland. I really enjoyed the class and learned so much from you. I am so glad that I purchased your book and was able to use it as a reference when I was paper-piecing. It will be a great reference in the future, too. The longer flexible curve worked like a charm to replicate the curves in the upper background. I have finished quilting my project, using a faced binding, and thought that you would like to see it. Thanks for a great learning experience. I also heard from Linda Talley of New Braufels Texas this week. Here is the beautiful quilt that she made. And here is a close-up of her quilt. I enjoyed your class at Houston so much – I actually finished something I started there!!! Two photos are attached of the table runner I made with 6 of the “geese”. 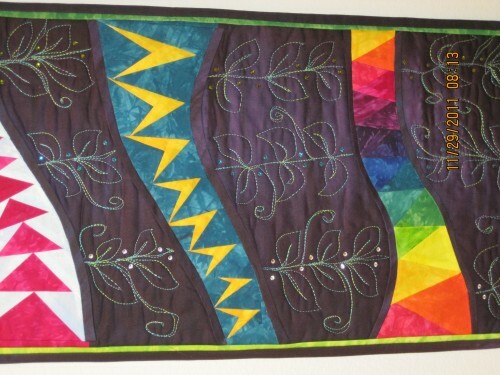 I quilted leaves as you did, but added bling. It’s so gratifying to hear from students who took one of my classes and send me photos of the quilts they made. Thank you Donna and Linda! 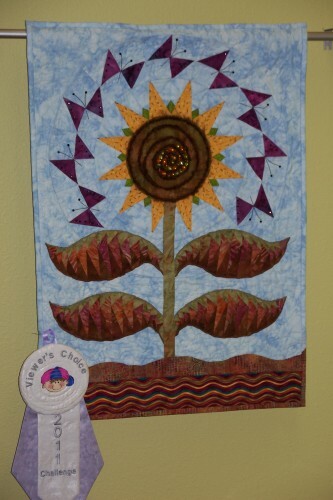 Mary Grass of Florida sent me this photo of her lovely quilt, Facing the Sun. Hi Gail……..I called you earlier this year and told you that I was making the “Facing the Sun” project from your book, “FLYING COLORS”. I mentioned that I was making it as my entry into my Guild’s Challenge competition for this year. The Challenge (my Guild’s name is “Citrus Friendship Quilters’ Guild) theme was Fall/Autumn so I used fabrics that fit that color scheme whenever possible. I’m attaching two pictures herewith as you said you would like to see the finished project. I won the “Viewers’ Choice” award and one picture is a full view with the winning ribbon and the other is a close up showing more detail. I am planning to do another project from this book as it is fascinating to me. Keep up the great work in your designs. 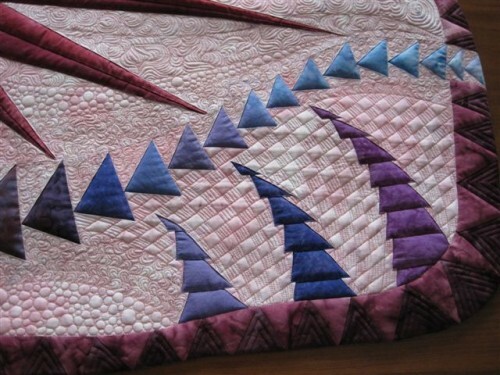 This is the close-up photo of her beautiful quilt. Thank you, Mary, for sending me the photos. 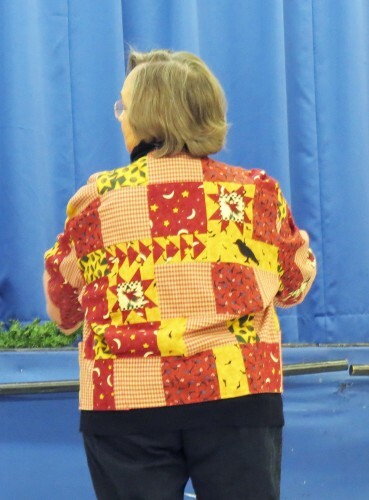 If anyone else has photos of a quilt they made from my book or while taking a class from me, please send them to me. I’d love to publish them here.